German CAD/CAM software developer, SCHOTT SYSTEME GmbH will launch their latest range of 5 axis prepositioned and simultaneous machining capabilities at the EMO 2013 exhibition in Hannover. SCHOTT SYSTEME provides standard 5 axis machine post processors at no extra cost. 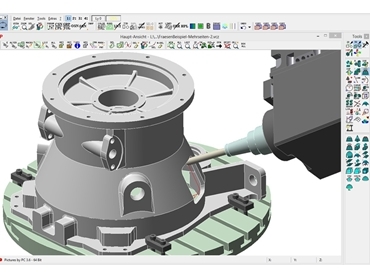 While 3+2 axis prepositional programming is included within the standard version of their ‘Pictures by PC’ CAD CAM software, 5 axis simultaneous programming is also available as an additional add-on module. The software supports the prepositional machining of 2.5D and 3D milling techniques, in addition to engraving and drilling. Feature recognition identifies regions to machine, with drill optimisation sorting multi axis holes into depth, machining orientation and shortest machining time. Numerous enhancements are included within the latest ‘Pictures by PC 3.6’ version. Multi axis rest material recognition both analyses and marks areas that require further machining with a smaller tool, enabling the residual material to be completely removed. Automatic safety retraction zones are set up around a part, so that any tilting movement of the machine head is undertaken away from the component. New machining strategies include 5 axis z constant simultaneous milling, and 5 axis double projection milling, which is popular with industrial engravers. SCHOTT SYSTEME’s Pictures by PC software has evolved into one of the most mature CAD CAM products available today with additional capabilities including turning, mill/turn, wire cutting and laser/plasma cutting. The EMO Hannover 2013 exhibition will be held from 16th to 21st of September. SCHOTT SYSTEME will be showcasing their products in Hall 25 - Stand H18.